So, I got this dress in the mail from H&M last week and wore to work the next day! Sweater dresses aren't anything particularly revolutionary or trendy this winter, but I definitely love them. I love this particular one so much that I now own it in two colors (see my other one here). I have a pretty casual workplace, which is awesome, but I get pretty sick of wearing jeans every day in the winter! So, casual skirts and dresses that I can wear with tights are definitely my friends. And this particular one hangs loosely, and is so comfy to sit in all day at my desk - a huge plus. Oh I LOVE this dress!! I love how you styled it, I need to check this dress out at my local H&M!!! 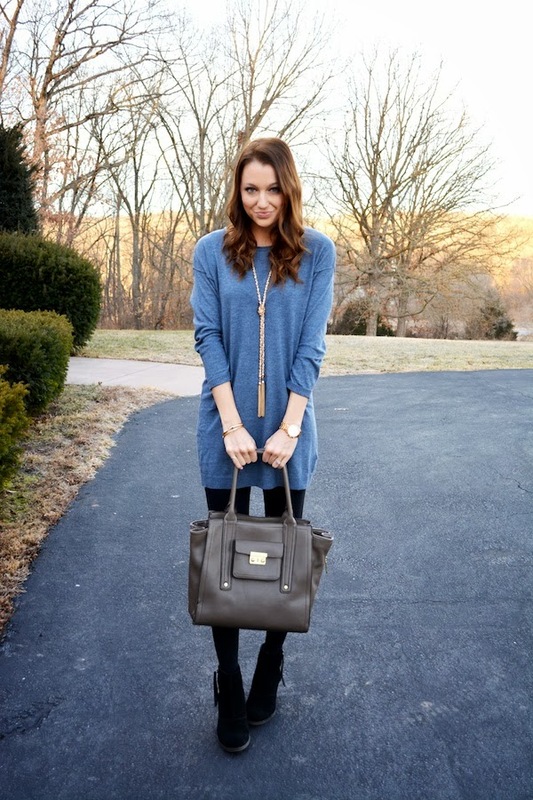 I love this sweater dress, and love the way you styled it. Such a cute look! Loving your boots and necklace! Simple and super chic. You look so pretty! Simple yet fabulous! Great outfit! I love the boots! They are so cute and look great with the dress. I love the long tassel necklace with the dress, it's so pretty! girl u even make a simple sweatshirt look so chic! love! Ooh that dress is perfect for so many occasions! Think I need to check out H&M soon! Super cute dress! I especially love the color! You look gorgeous, I love how comfy sweater dresses are. They totally a winter staple. That tasseled necklace!! Divine, love it, you have the art of elegant minimalism pinned down, you do it so so well Jacy! I enjoyed reading your opinion on my last post...Good wishes for the weekend! GORGEOUS! This dress and tassel necklace are perfect together! Your outfit looks so comfortable but still dressed up...love that necklace.